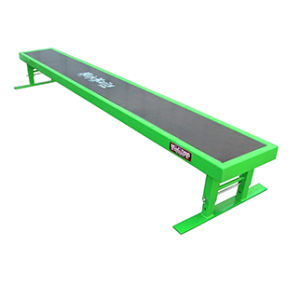 Featuring a Welded Steel Frame for maximum grinding ability, the 7ft x 6in x 12in Mojo Skate Bench is perfect for perfecting your Skateboard, BMX Bike, Extreme Scooter, Snowboard, Inline Skate trick skills. With a Powder Coated finish and Resin Coated Marine Grand Plywood Top, this Skate Bench will be able to withstand your best and your worst! Featuring adjustable heights, YOU have the ability to test your skills the way YOU want, where YOU want, at the level YOU are at.